What a refreshing read! I’ve been reading a lot of stuff that’s sort of out of my “for pleasure” reading zone, and while a lot of those works have been really interesting and worthwhile, not all of them have been quite as enjoyable. 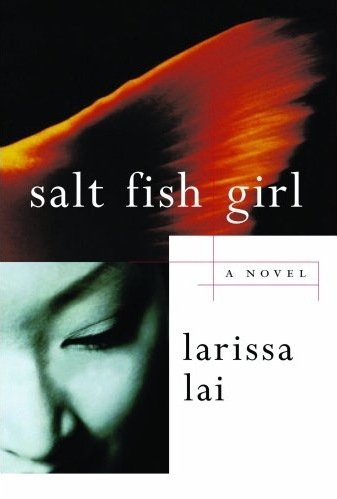 Larissa Lai’s novel was so…well, fresh. Okay, so part of what makes this novel so interesting to me is the “magical” aspect of it. It does “magic” in a very different way than some of the works I’ve been reading. For one thing (and this is not one of the “very different” aspects of it), the magic in this novel is very firmly grounded in folklore — in a creation story, as a matter of fact. But another significant aspect of it is the prominence given to lesbian relationships. Not only is the creator in the creation story a female, but she becomes human only to fall in love with another girl. And of course, the present-day main character version of the creator finds herself reinserted into that same romance (with a woman named “Evie” of all things). In a similar vein, by the end of the novel the women have found a way to reproduce through produce that renders men 100% unnecessary. There’s a lot of really interesting stuff happening at the level of gender and sexuality. And of course, there’re some interesting things going on with regards to genetics and cloning. The whole idea of making people — carelessly, recklessly creating disposable people on a whim — is a dominant theme throughout Lai’s novel. What do we do with people once we’ve created them? Are we responsible for them? If they’re cloned, if their blood contains non-human DNA, if they’re just different enough, can we call them something other than human? And once they’re no longer classified as “real people,” can we take away their rights and use them as we please? The novel’s publication date (2002) should be a good indication of how much the global cloning debates influenced the storyline and inspired Lai’s imagination. I’m also really interested in the politics of this novel. Lai tackles feminism, discrimination, socioeconomic standing, etc. There’s so much to talk about, and I’m trying to decide if there’s room for this novel in my dissertation.